Up to 25 % more clamping force and higher output with the same clamping cylinder that is used to actuate our SPANNTOP chucks. The pyramid arrangement of glide surfaces makes it possible: The clamping head rests with full-surface contact in the TOPlus chuck body even with large work piece tolerances. Inaddition this geometry ensures that TOPlus is signifi cantly less sensitive to contamination than the previous chuck/clamping head solutions. And that with a concentric precision of approx.0.015 mm [for chuck size 65]! Thus TOPlus is even better suited for raw material, cast and forged parts, as well as fi ne-particle non-ferrous metals such as brass. 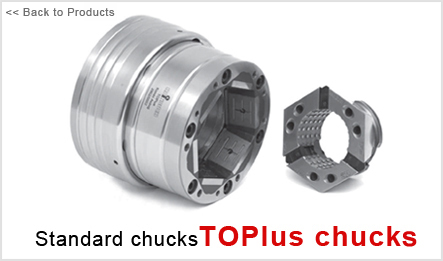 Therefore all-round optimized values make the chuck an ideal partner for modern manufacturing strategies and state-of-the-art machine tools.